This is a literal translation of the Chinese expression yao shi tong yuan, which indicates that in the traditional Chinese perception food and medicine are substances derived from the same raw materials. There is a strong link (overlap) between pharmaceuticals and food in traditional Chinese thinking about food, nutrition and preventing/curing disease. The function of many medicinal plants is often referred to as restore (bu) in Chinese. Medicine brings the diseased body in balance again. The various basic flavours are also accredited medicinal functions. One consequence of this view on food and medicine is the existence of medicinal restaurants in China. You can tell the cook about your ailments, and he will compose a meal with ingredients that address those problems. This is called yaoshan, ‘medicinal meal’, or shiliao, ‘cure through eating’, in Chinese, again a combination of medicine and food. This part of the Chinese cultural heritage has a strong influence on Chinese policy making. A good example is the Chinese government’s strong attention to promoting public nutrition. While most Western governments believe that promoting fortified foods is misleading the public from a more healthy diet, the Chinese authorities are actively promoting fortified foods. See our special item about that topic. If you think that the modernization and the increased influence of Western thinking in China will make this belief in the healing power of food disappear, you are very wrong. On the contrary, we have seen a number of foods fortified with traditional Chinese medicinal herbs appear on the market. 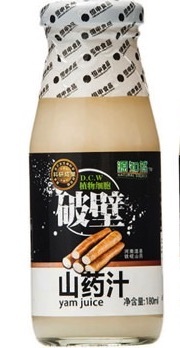 An example is honey fortified with dangshen (radix codonopsis), a ginseng-like root. Ginseng itself is also more and more used as an ingredient in Chinese dishes. The national authorities have issued a list of 87 TCM herbs that are allowed as food ingredients. TCM has especially inspired the development of a range of health drinks. I will mention a couple of the most representative here. Cansi’s (Nengshi) “stewed pear with rock sugar is positioned as an ancient folk recipe that has been spread for thousands of years throughout China”. Some of the claims the product makes are to “lubricate lungs” and to “relieve stress”, with pears playing an integral role in traditional Chinese medicine. 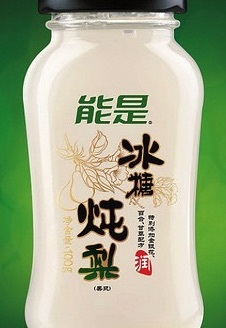 The product also has TCM ingredients, such as honeysuckle and lily extract. Natural Source’s Wall Breaking Yam Juice earns it name from the technology it uses. With its yam juice processing, it’s claimed that superior technology can break the cell wall to release additional molecules for nutrition value. The result is that when consumed, it increases the absorption rate by 80%. Yam is one of many traditional Chinese medicinal ingredients that are being processed, combined with other flavours and packaged for modern times. 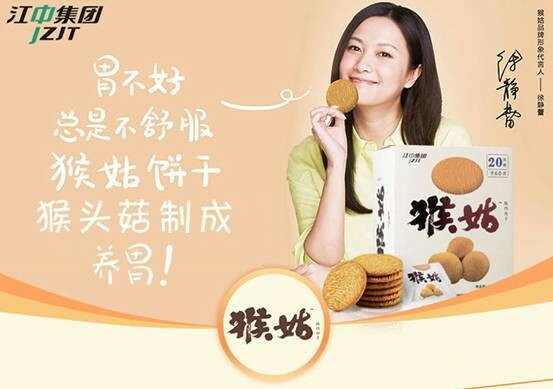 The Jiangzhong Pharmaceutical Group, that became famous for its successful TCM drug against stomach ailments due to indigestion, has launched a biscuit with extracts from the hericium erinaceus fungus in 2015. It is an age old ingredient in Chinese cuisine and an equally old raw material for TCM drugs against problems in the entire digestive tract. Chinese military researchers are are also developing modern applications for traditional herbs. An interesting item we have spotted in this category is an ‘antiradiation biscuit’, a biscuit with the extracts of five Chinese medicinal ingredients. It has been developed for military use, but has also been made available to the general public. We have not yet found it on any supermarket shelf though. The Wuhan College of Military Economy has develop a type of biscuit that can increase the body’s oxygen level and alleviate fatigue for 48 hours. The recipe includes a number of herbs from traditional Chinese medicine. Once more, this product has been developed for use by soldiers, but it will also have an interesting market in tourist destinations in high elevations, like Tibet. Problems caused by oxygen deficiency often spoils part of the fun among tourists in such regions. One way for TCM to redefine itself to fit into the present age is to link up with a popular beverage like coffee. 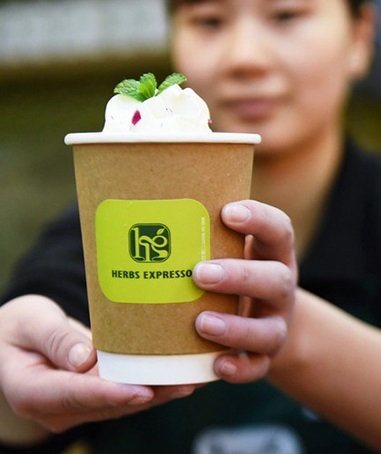 A time-honoured traditional Chinese medicine store Huqingyutang has opened a cafe named “HERBS EXPRESSO” to sell ‘coffee’ in Hangzhou (Zhejiang). Unlike regular coffee, which is extracted from coffee beans, the cafe’s ‘coffee’ is sourced from herbs and processed with a coffee machine. Actually, the ‘coffee’ is a coffee-flavoured herbal drink, the cafe’s manager said. Mixing fresh fruits, milk and cream, the taste of the new herbal drink is better than the traditional herbal soup. “By improving the taste of herbal drinks, we want to promote traditional Chinese medicine culture to the world,” the manager added. Multinationals have started to note this development as well. Lipton is marketing a tea on the Chinese market with extracts from Chrysanthemum, honeysuckle and lily. The tea is named: Qing heng cha, ‘clearing balance tea’. Clear heat, relieve toxic fire – hot, painful swellings in the throat, breast, eyes; intestinal abscesses. Expel wind-heat – fever, aversion to wind, sore throat, headache; also for summer-heat. Clear damp heat from the lower jiao – dysentery, lin syndrome. Disperses wind, clears heat (bitter, cold) – headache, fever. Clears liver and the eyes (sweet, cold) – wind-heat in the liver channel manifesting with red, painful, dry eyes or excessive tearing, or yin deficiency of the kidneys and liver with floaters, blurry vision, or dizziness. I wonder why Unilever has not yet started marketing this range (there or more such teas available on the Chinese market). Meanwhile, the famous Pu’er tea from Yunnan is also marketed worldwide a slimming aid and a way to lower blood lipids. Example of a foods that are ascribed medicinal functions according to TCM in this blog are: dates (jujubes) , lotus pods, sea cucumbers, and dried plums (huamei). Examples of foods enriched with medicinal ingredients introduced in this blog are: moon cakes and some military food. 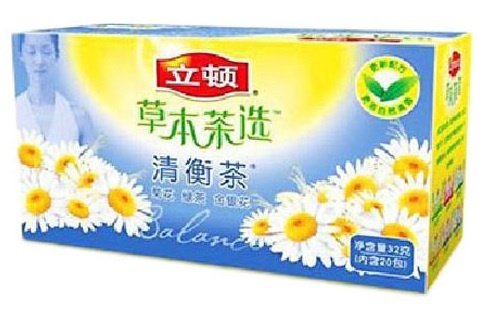 A new development is the use of selected TCM herbs as ingredients for animal feed. Practitioners in China have prescribed bitter blends of medicinal plants and herbs for centuries to ward off disease in humans. Now, farmers are adapting the age-old elixirs — a dash of ginseng here, a speck of licorice there — for use on livestock. They’re hoping to tap into the growing popularity of traditional medicine and health food in Chinese society. The expected results are not only delicious but healthy: lean, juicy meats that can protect against colds, arthritis and other illnesses. A Guangxi farmer began mixing 22 kinds of herbs into the daily feed for his livestock several years ago. The pigs that he raises sell for more than double the price of ordinary pigs, and some customers even eat his meats instead of taking medicine. Farmers like Mr. Lin hope that China’s increasingly health-conscious middle class will help bring medicinal meats into the mainstream. The health-food market in China reached $1 trillion last year, and it is expected to grow 20% annually for the next several years. This entry was posted in Uncategorized and tagged China food medicine nutrition antiradiation biscuit tea TCM by eurasiaconsult. Bookmark the permalink.